An age-old tradition which is based on a set of established theories; most admirably written through a series of 5900 verses; so intricately interwoven with a yarn of metaphors and similes; reflecting the wisdom of one of the world's oldest and untouched civilization, is today, revealed to the world to be cherished and appreciated by every single citizen of this planet. Tibetan Medicine is an art because it shows how to live a life skillfully. 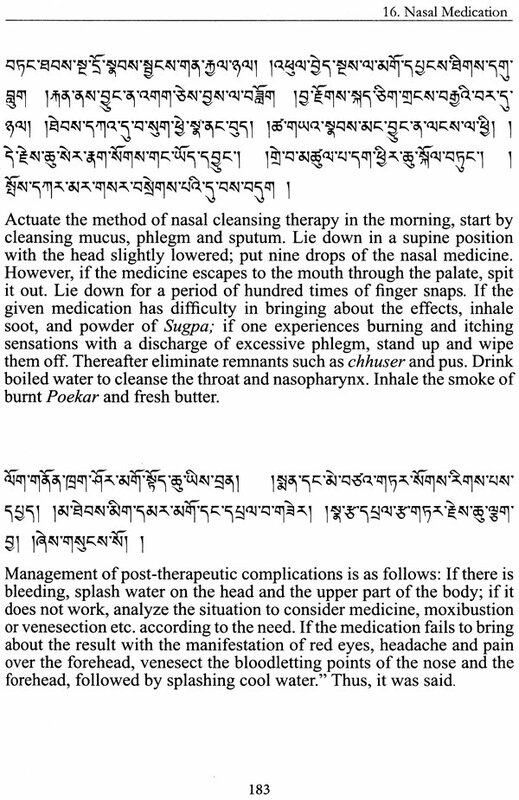 Tibetan Medicine is a science too, as it can be empirically proven through debate and practical application. Tibetan medicine can also be claimed to be a philosophy, on the ground that it shares a deep connection with Buddhist philosophy. Tibetan Medicine is the ultimate solution in answering to many present-day crises of psychological and psychosomatic problems, as this system is an integrated science. This multi-faceted wisdom, which comes in a single pack, is called 'Gyueshhi', the fundamental text of Tibetan medicine. Gyueshhi contain four tantras, namely Tsa Gyue (The Root Tantra), Shed Gyue (The Explanatory Tantra), Man Ngag Gyue (The Oral Instruction Tantra) and Chima Gyue (The Subsequent Tantra). The former two tantras encompass the foundation on which the entire principles of Tibetan Medicine rest. 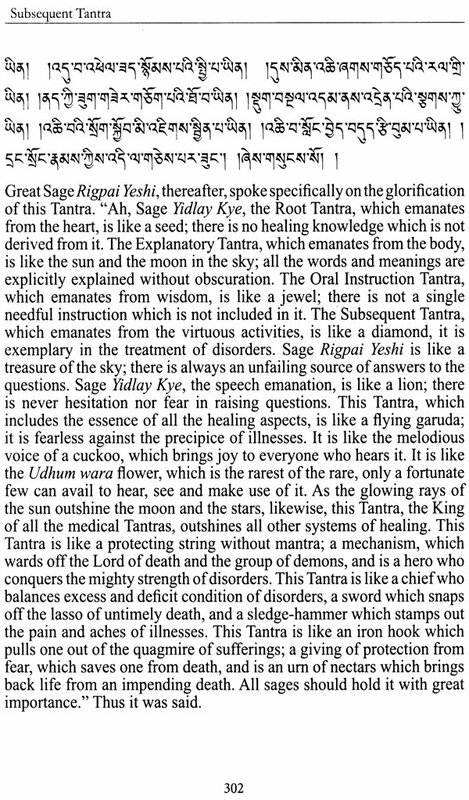 The latter two tantras elaborate more on the classification of disorders, as well as in practical application of diagnosis and therapeutic aspects of Tibetan Medicine. This edition on the translation of the Subsequent Tantra is a testimony of Tibetan people's sincerity in sharing their wisdom with others and in undertaking the responsibility to provide health to all human beings. The Traditional Tibetan medical system is composed of a vast indigenous healing knowledge and practices offering a holistic treatment aimed at regulating and maintaining the balance of the functional principles of the mind and body. These principles are related to the characteristics of the cosmic elemental energies and as such any disturbances in the environment directly or indirectly affect the health of a person. The long history it enjoys, the sound foundations on which it is established and the increasing popularity it has earned are clear indications that Tibetan Medicine is relevant and important in the modem world. 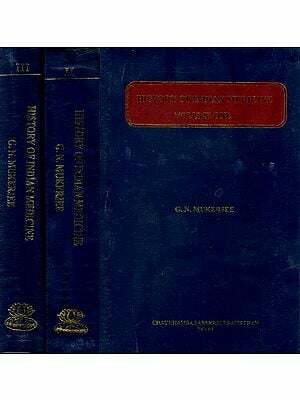 These valuable medical treasures are found in the highly esteemed "Gyueshhi"(Four Tantras), a complete and profound multi-faceted fundamental text of Tibetan Medicine, encompassing the unabridged theories and practices of Tibetan Medicine. It is the creation of ancient eminent scholars of Tibet by means of practice, invention and development through their intellectual wisdom. 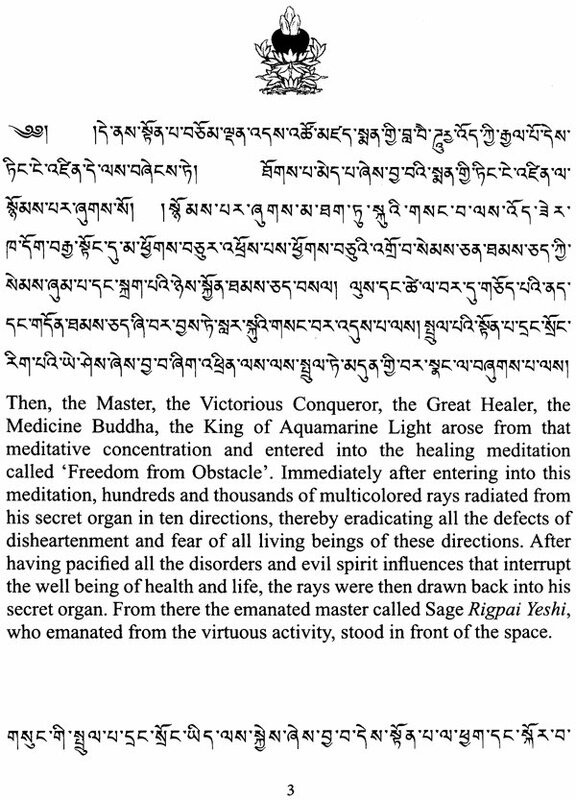 Based on the practical experience of the ancient medical knowledge of Tibetans that relates to their unique culture, its custom and environment, the legendary Yuthok Yonten Gonpo, father of Tibetan Medicine, composed Gyueshhi by incorporating the essence of the then known Asian medical systems including Ayurveda, Chinese and Greek medicine; making it one of the oldest, most comprehensive and reliable medical systems in the world. 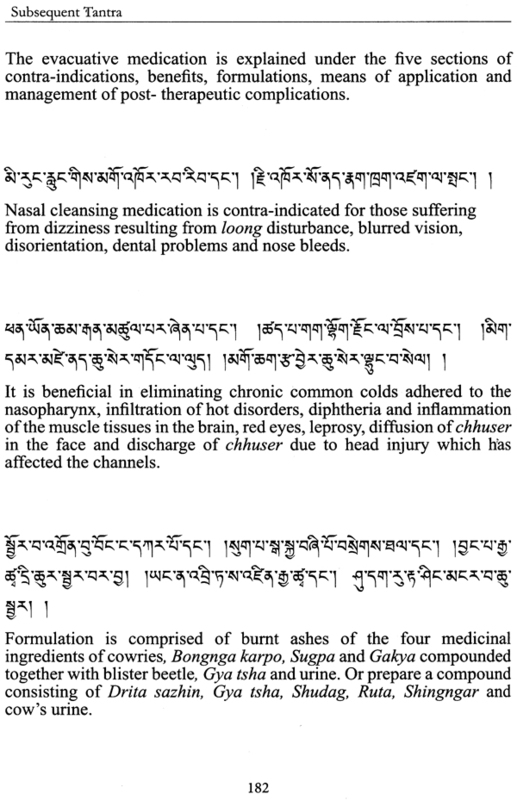 Tibetan Medicine is one of the oldest surviving medical systems with an enormous herbal pharmacopoeia, complex and systematic manufacturing processes and a complete system of diagnosis and treatment. The most essential principles of Tibetan Medicine are harmony and balance, establishing it with an inspiring relevance to the health problems of the modem world and in the prevention of various psycho-physical disorders. The teaching and practice of Tibetan Medicine is mainly concentrated in Tibet, however, the entire belt of the Himalayan region, India, Mongolia, Kalmykia, Buryatia and a few countries in the West also shared the practices of Tibetan Medicine. Due to the growing popularity of Tibetan Medicine worldwide and a steady growth in the number of people interested in Tibetan Medicine, as well as in line with the enduring wishes of His Holiness the Dalai Lama, the time has come to pass on this precise knowledge and instruction. Our goal is to share Tibetan medical knowledge and its practices by making it available especially to non-Tibetans, and for it to be widely utilized by all English speaking medical practitioners, scientists and researchers who have a commitment to providing quality health care to all human beings. 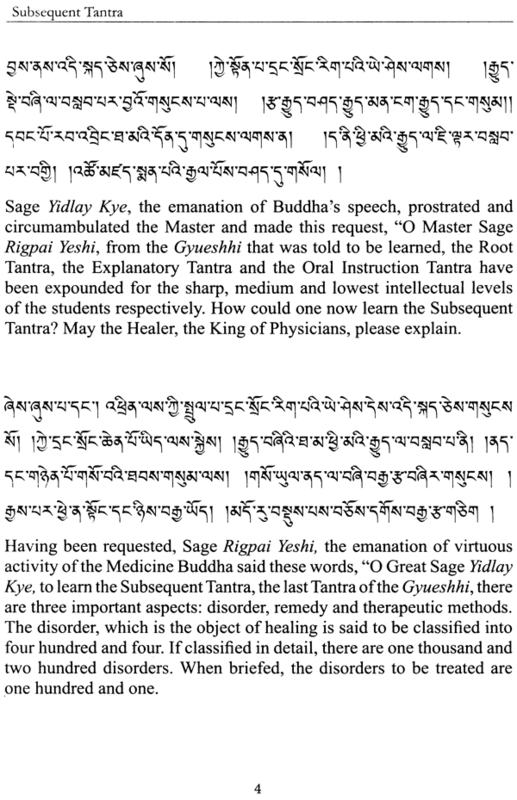 As such, overcoming the narrow attitudes of seclusion and secrecy, Men- Tsee-Khang has started a translation project to make available an authentic interpretation of the original Tibetan medical knowledge for interested people all over the world, so that new thoughts and methods can be introduced to facilitate greater benefits for the peoples of the world. In the series of the translation project, the Subsequent Tantra, which is the last Tantra of the Four Tantras encompassing the important theoretical principles of the major practical applications of Tibetan Medicine, is translated here. 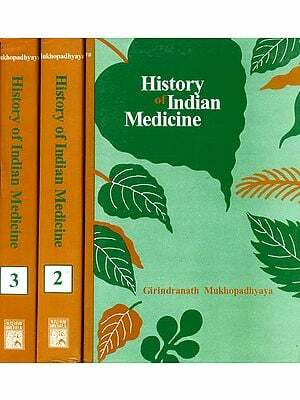 It includes comprehensive diagnosis, systematic methods of manufacturing different forms of medicines, systematic ways of applying different evacuative and external therapies and the summarization of the complete knowledge and practices of Tibetan Medicine. The comprehensive and systematic discourse on pulse and urine examination, the two most important and most common means of diagnosis in Tibetan Medicine are expounded elaborately at the beginning of the Subsequent Tantra. This is followed by the systematic processes used in the manufacture of various forms of Tibetan Medicines such as: decoctions, powders, pills, pastes etc. and their use for specific disorders, as well as the intricate practice of manufacturing precious medicines and herbal compounds. Also covered in a comprehensive manner is the application of mild therapies such as purgation, emesis, enema, compress, massage etc. and the application of drastic therapies such as moxibustion, venesection etc. In the conclusion, a brief account on the significant aspects of managing the practical applications of Gyueshhi is summarized followed by a clear-cut guidance on the transmission of Gyueshhi to worthy students. 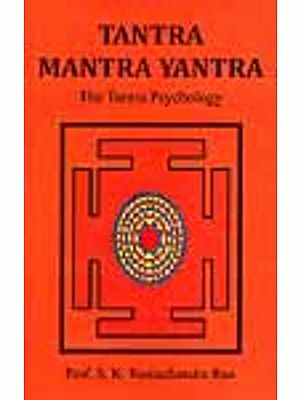 An understanding of the entire body of knowledge and the practices of the Subsequent Tantra have been intricately interwoven with a yarn of metaphors and similes that clearly reveal the wisdom of one of the oldest civilizations of the world.